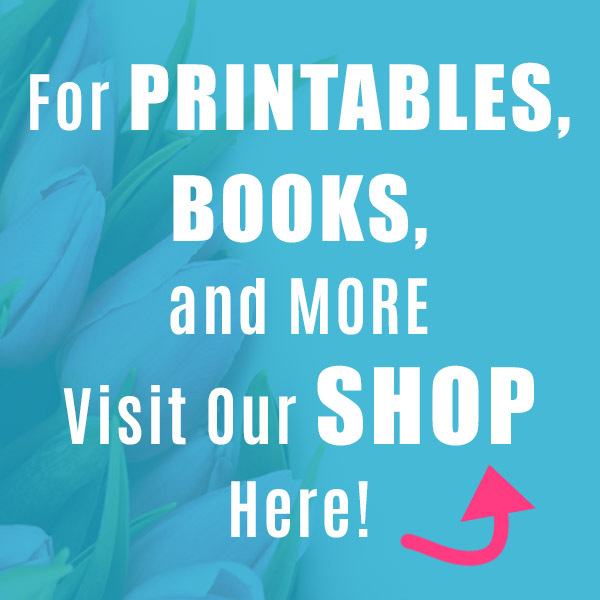 Now that it’s officially spring, it’s time for all things flowers! Even if the flowers aren’t in bloom just yet where you are doesn’t mean you can’t make some pretty flowers yourself. And these are ones you can eat! 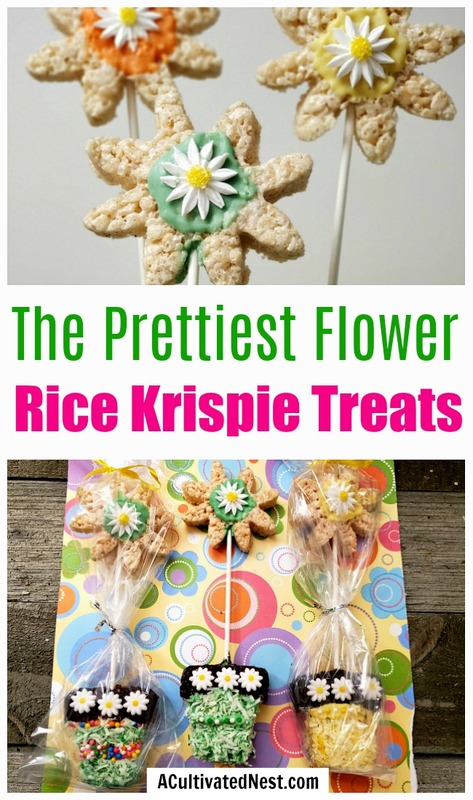 For a fun spring treat, you have to make these Flower Pot Rice Krispies Treats! 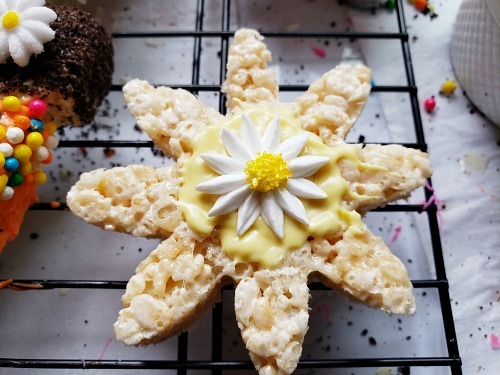 These pretty edible flower shaped rice krispie treats are great as after-school snacks, but would also be perfect for a spring party treat! Plus, these are super fun to put together. 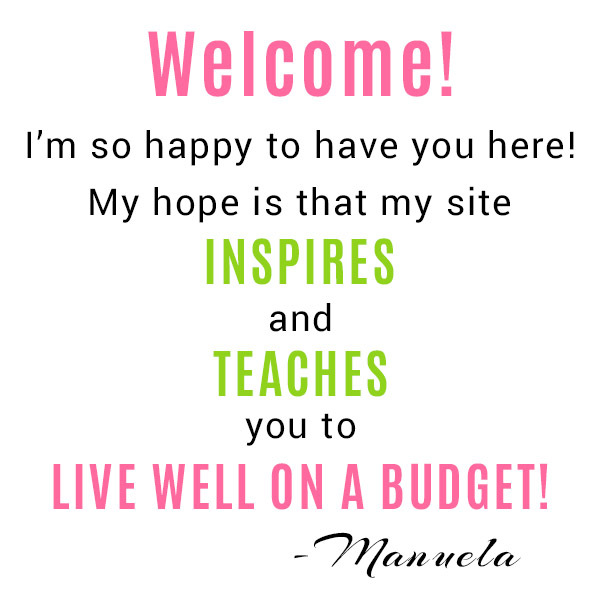 You can be so creative with your colors and decorations! 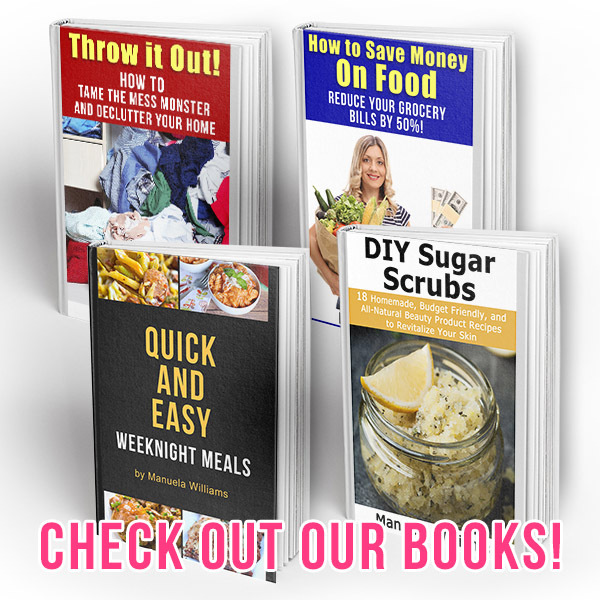 If you have kids, have them help you out! 1. Grease two bread pans with butter. Set aside. 2. In a large pot over medium heat, melt butter. 3. Add mini marshmallows to pot and stir to melt and incorporate with butter. 4. Remove pot from heat. 5. 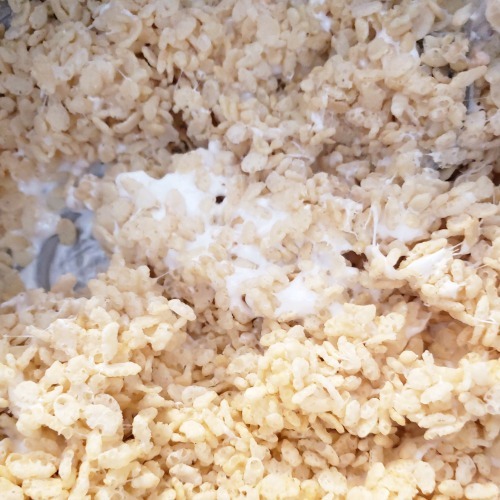 Add Rice Krispie cereal and mix well. 6. Divide the mixture evenly between the two pans. 7. Using a rubber spatula, press the cereal firmly into bread pans. Set aside. 8. 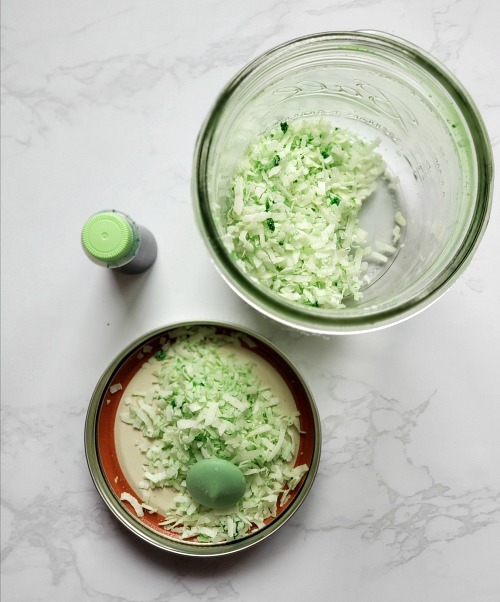 Prepare the colored coconut by adding 2 cups coconut to a canning jar and 1⁄4 tsp green gel food color. 9. Place lid on jar and shake vigorously. 10. Check the color against the green melting chocolate for similarity. Add more gel color to achieve the desired color vibrancy. Note: There should be pops of bright green and pale green as well. 11. Empty coconut into a shallow bowl. 12. Prepare the double boiler by adding water to a large pan that will hold several small dishes of melting chocolates, along with 1/8 tsp coconut oil in each dish. I used ramekins to hold my chocolates. Stir occasionally. Heat on low temp. 13. 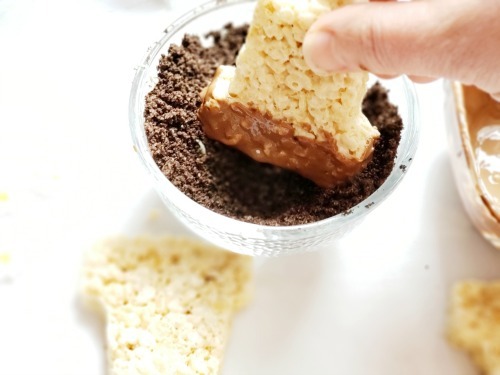 Blend Oreo cookies into crumbs with a food processor, or crush them by hand. Pour into small dish. 14. 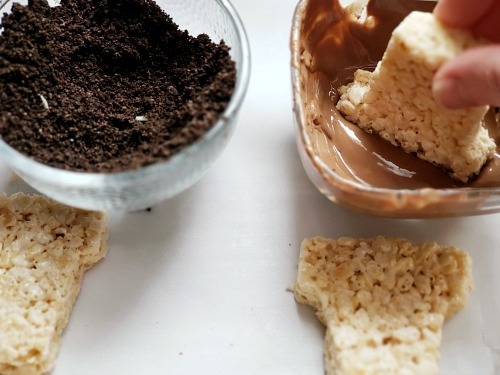 Carefully remove rice treats squares from pans and place on flat surface. 15. To create the flower pots, start by cutting the shapes. 16. Dip top rim end of pot shape into brown melting chocolate and immediately into Oreo crumb to coat. Set aside on wire rack as you complete all 6 pots. 17. To create a grass bottom for your pots, dip each flower pot into green melting chocolates, using a knife to help smooth and cover completely. 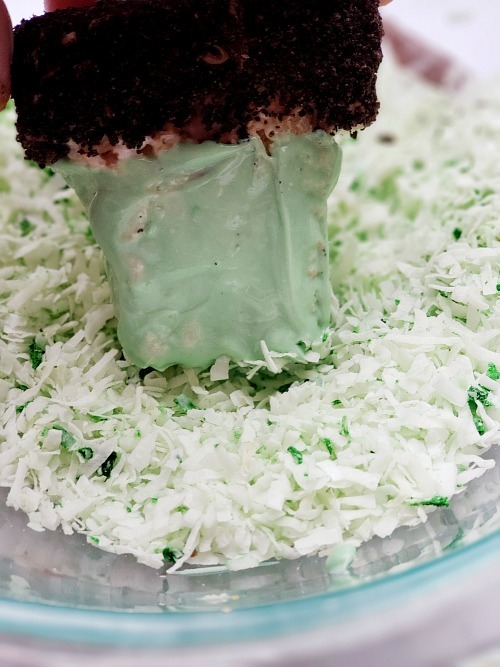 Immediately cover green chocolate with green coconut. 18. 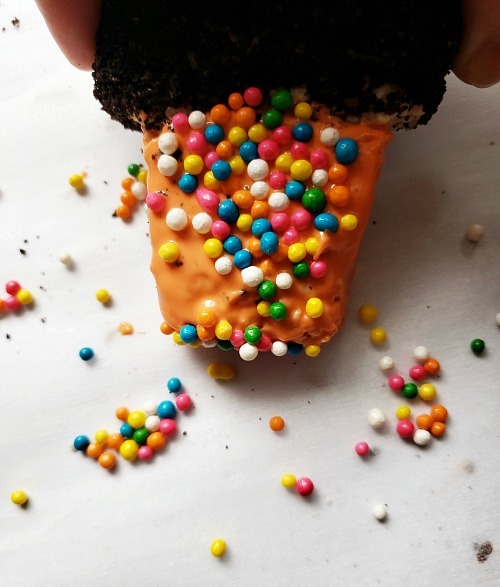 To create a decorative pot bottom instead of a grassy one, embellish with melted chocolates and candy sprinkles. 19. To create the flowers, start by cutting them out. 20. To decorate the flowers, with a knife dipped in the melting chocolate color of your choice, create a large center circle on the flower. 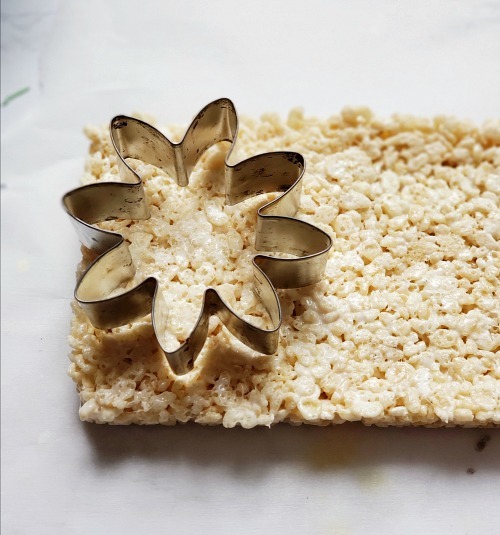 Embellish with sugar flowers or sprinkles. 21. To assemble the pots, do the following (this can be done before decorating to prevent crushing any delicate sugar work): Insert one end of long lollipop stick into brown melting chocolate and insert into center of pot, pushing at least half way through. Set aside while completing all 6 pots. 22. Dip end of sucker stick into any color melting chocolate and carefully insert into center edge of flower, at least half way. Repeat for remaining flowers. 23. 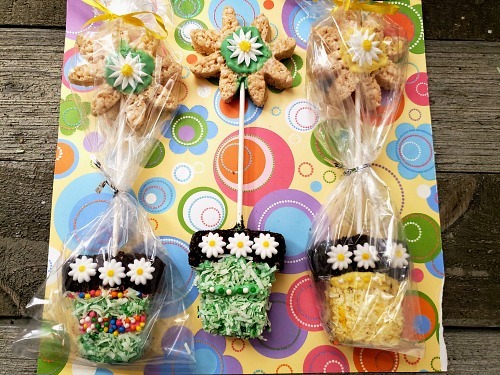 Finish off your flower pot rice krispies treats with long clear plastic treat bags and ribbon. 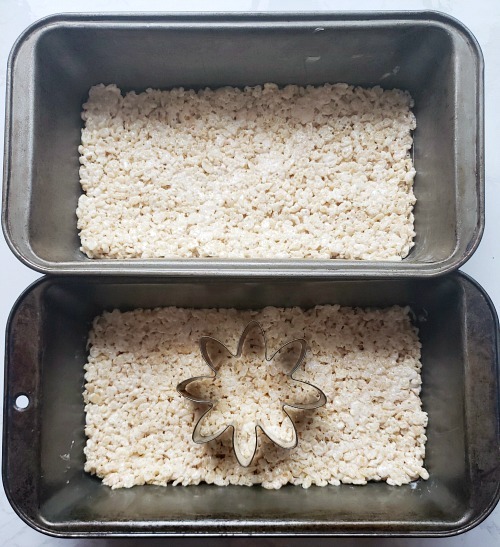 Then your flower pot rice krispies treats are ready to gift and enjoy! 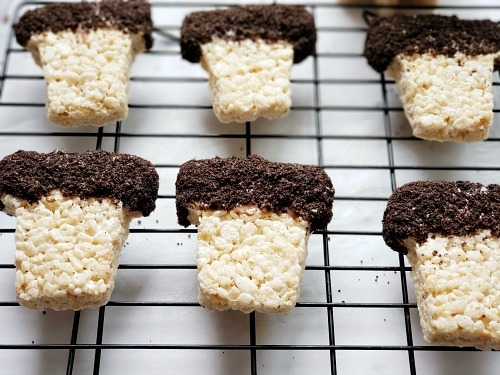 Have you ever made a fun custom rice krispies treat dessert? What did you make? 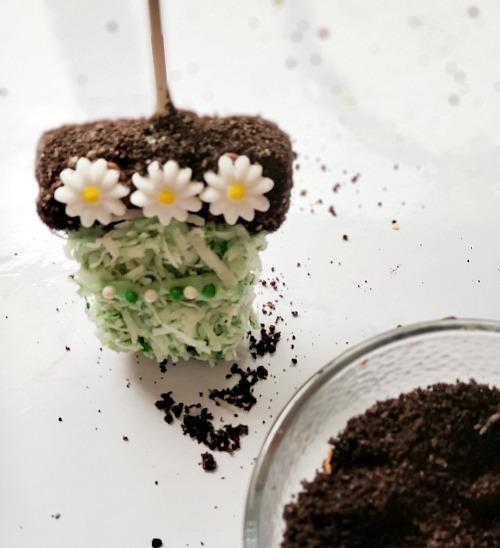 For a fun spring dessert recipe, you have to make these adorable flower pot rice krispies treats! These would be perfect for spring party treats! Grease two bread pans with butter. Set aside. Add mini marshmallows to pot and stir to melt and incorporate with butter. Add Rice Krispie cereal and mix well. Divide the mixture evenly between the two pans. Using a rubber spatula, press the cereal firmly into bread pans. Set aside. Prepare the colored coconut by adding 2 cups coconut to a canning jar and 1⁄4 tsp green gel food color. Place lid on jar and shake vigorously. Check the color against the green melting chocolate for similarity. 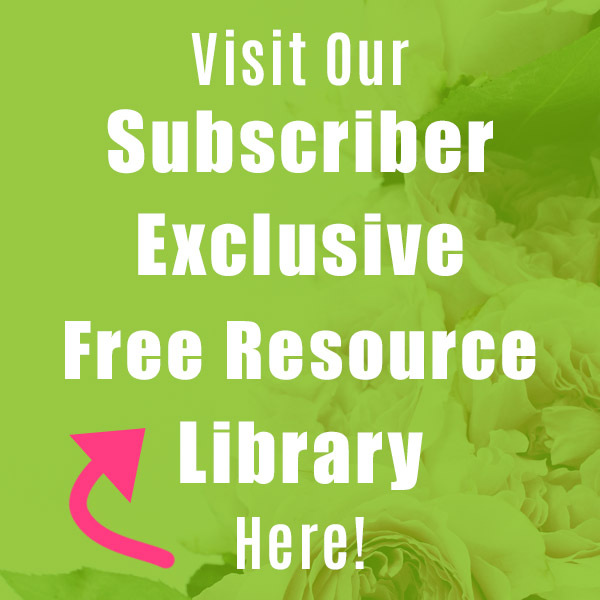 Add more gel color to achieve the desired color vibrancy. Note: There should be pops of bright green and pale green as well. Empty coconut into a shallow bowl. Prepare the double boiler by adding water to a large pan that will hold several small dishes of melting chocolates, along with 1/8 tsp coconut oil in each dish. I used ramekins to hold my chocolates. Stir occasionally. Heat on low temp. 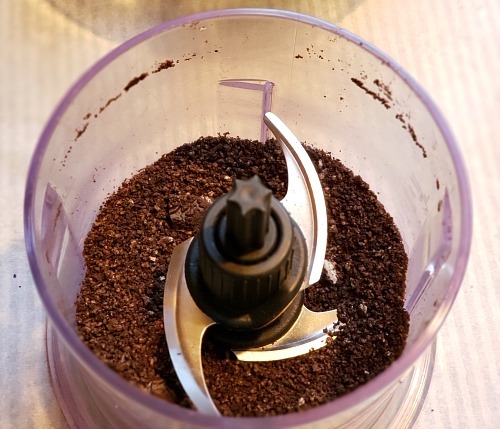 Blend Oreo cookies into crumbs with a food processor, or crush them by hand. Pour into small dish. 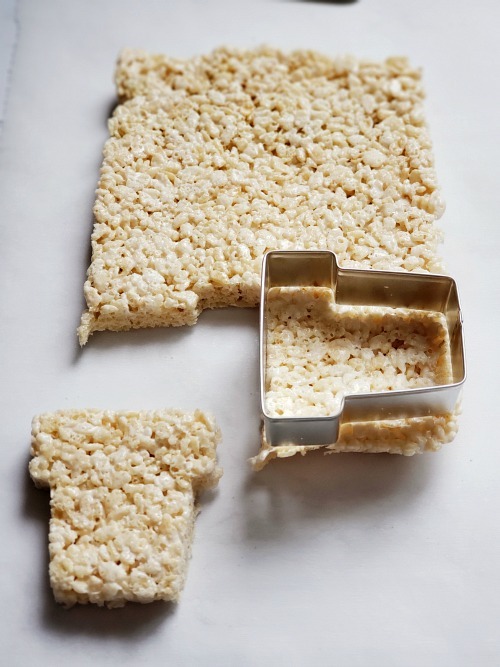 Carefully remove rice treats squares from pans and place on flat surface. To create the flower pots, start by cutting the shapes. Dip top rim end of pot shape into brown melting chocolate and immediately into Oreo crumb to coat. Set aside on wire rack as you complete all 6 pots. To create a grass bottom for your pots, dip each flower pot into green melting chocolates, using a knife to help smooth and cover completely. 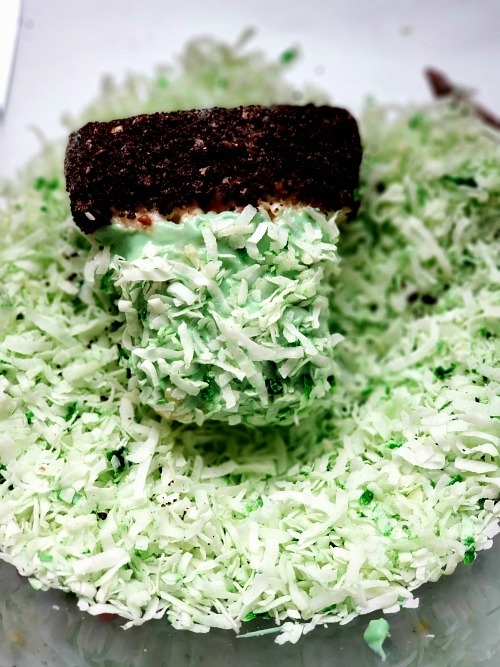 Immediately cover green chocolate with green coconut. 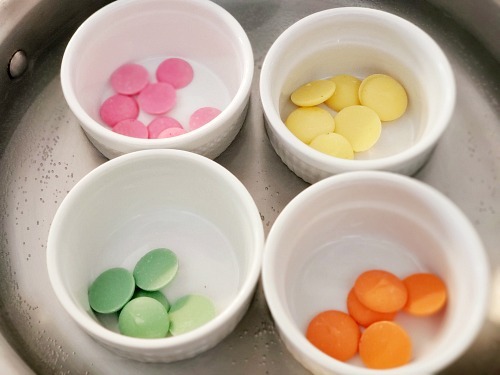 To create a decorative pot bottom instead of a grassy one, embellish with melted chocolates and candy sprinkles. To create the flowers, start by cutting them out. To decorate the flowers, with a knife dipped in the melting chocolate color of your choice, create a large center circle on the flower. Embellish with sugar flowers or sprinkles. To assemble the pots, do the following (this can be done before decorating to prevent crushing any delicate sugar work): Insert one end of long lollipop stick into brown melting chocolate and insert into center of pot, pushing at least half way through. Set aside while completing all 6 pots. Dip end of sucker stick into any color melting chocolate and carefully insert into center edge of flower, at least half way. Repeat for remaining flowers. 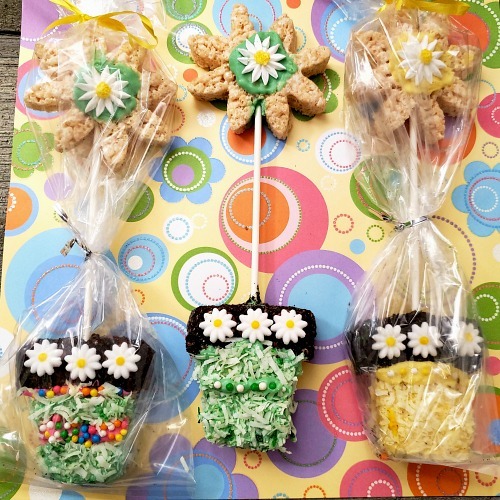 Finish off your flower pot rice krispies treats with long clear plastic treat bags and ribbon. 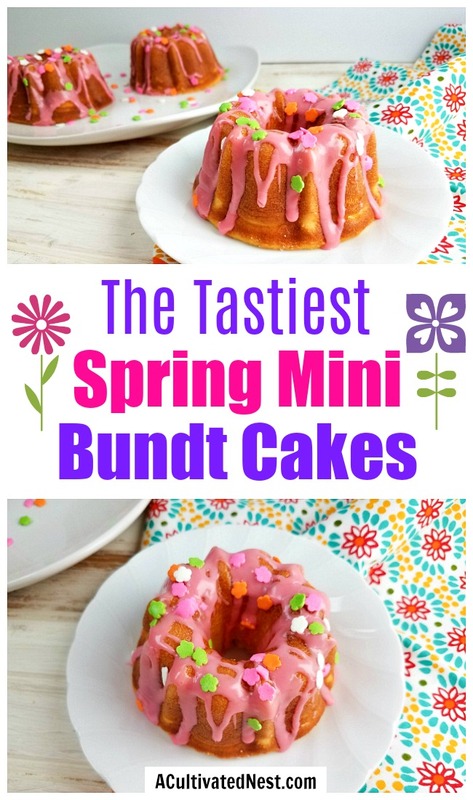 These are so cute and would be a lot of fun to make with Children!